A couple of years ago, I discovered a blog called Tea and Cookies — it was listed by the London Times as one of the 50 Best Food Blogs in the World. I was hooked instantly by Tara Austen Weaver’s fascinating stories of food, travel, cultures, family and friends, and oohed and ahhed over all the gorgeous photos in each and every post. Just found out that “Tea,” as Tara’s friends call her, has written a book about the first few months she lived high in the mountains of central Japan. Always up for an adventure, she set forth for Takayama when she was just 22, fresh out of grad school. 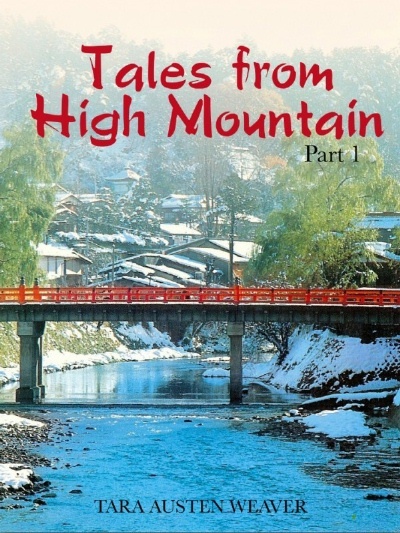 Tales from High Mountain: Stories and Recipes from a Life in Japan is a chronicle of her immersion in a foreign culture, living in a centuries-old, rural town with an established family. There are feasts, festivals, ancient temples, and many new “rules” and customs to learn. The incredible, edible egg has apparently inspired some pretty cool songs. Back in the day, I once went to the airport with friends to greet Simon and Garfunkel. We waited for hours at the arrival gate with leis and a giant gingerbread boy (we were convinced Paul Simon was the cuddly type, so we referred to him as Bunny Boy). We were also certain that Paul would love the gingerbread boy, since it resembled him. Such is the folly of youth. Paul and Art whizzed past us and all the other screaming fans, without so much as a nod or a wave. Wow. What a let-down. The gingerbread boy went into the trash, but we attended their concert anyway. It turned out to be one of the best acoustic performances I have ever heard. It made up for our disappointment many times over. Almost ten years later, Paul Simon hatched an idea in the Soy Eng Look Restaurant in New York City’s Chinatown. I imagine he wagged his wattle when he saw the menu. “Mother and Child Reunion” was included on Paul’s first self-titled album after he and Art Garfunkel parted ways, and is considered to be one of the first tunes by a white musician to feature reggae elements. Paul seemed to embrace world music after that,cluck cluck. In case anyone else out there has had a disappointing rock star moment, here is some comfort food courtesy of the Japanese. To prevent any more arguing over which came first, the chicken or the egg, this tasty, easy-to-prepare dish features both. We eat this chicken-egg omelet quite often here at alphabet soup. It’s almost as good as a hug from Mom! Flavor is of course enhanced if this is consumed while listening to Bunny Boy sing. Saute chicken in oil. Add stock and cook until chicken is tender on medium heat. Add seasonings and green onions. Beat eggs and pour over chicken mixture evenly. Cook on low heat until eggs are coddled. Fill bowls with rice. Cover with chicken/egg mixture and pour sauce over all. Sprinkle crushed toasted nori on top for garnish. TIPS: Best to use a deep bowl for serving. You may be able to find authentic Donbori bowls at an Asian supermarket that sells dishes. It usually comes with a cover, so that the dish can steam a little with flavors mingling, just before eating. Hmmm . . . chicken egg, egg chicken?